What is the best diaper bag? You must have been asking yourself that all the time since you’ve had your newborn baby. Certainly, it takes hours to look through subject websites or mom blogs and to revisit online stores. Surely, you know you could have spent that time in a more pleasant way. But the problem must be solved. A baby diaper bag is exactly what you need. Why? Because a well-organized diaper bag not only stores your belongings but also keeps your nervous system healthy. Our review will help you to save your time and to make up your mind about which diaper bag is best for you. Generally speaking, a diaper bag can hold not just diapers but plenty of other things, too. The choice depends on the number of essentials you intend to store in there. Small diaper bags are very lightweight. Carrying them is easy. You can put the most necessary things there without feeling a shoulder pain or back pain. A small diaper bag is a perfect bag for a short trip. However, that doesn’t mean that you can do without a greater bag. Small diaper bags can be so tiny that you can hardly cram there a water or milk bottle. A large diaper bag is much heavier than a small bag. You can use it as a weekend bag because it is rather roomy. Numerous baby clothes, pacifiers, bottles can be placed there with ease. Besides, you can take with you a laptop, a few books and other items you personally need for a nice, relaxing weekend. Could a bag with pacifiers and diapers be fashionable? Of course! Why not? There are many very cute models. If you worry about your looks a lot, take a note of trendy diaper bags. Glamorous bags cost a pretty penny. There are many diaper bags that come with a nice exterior. Don’t forget to turn your attention to the material a bag is made from. The most popular types are cotton and canvas. Such bags are sturdy and could be washed in a washer easily. A little tip: choose a diaper bag with zippers. Unlike a loud Velcro ripping, a zipper slides without making noise. Hence, you will not wake your newborn baby up accidentally while opening the diaper bag. Everybody knows that a designer diaper bag is not cheap. Especially not one of the best designer diaper bags, which are handmade or sewn by top designers. Of course, we can save a good deal of money by choosing a bag with the lowest price, but it hardly helps to save your money. The total cost of ownership of such a bag is not exactly inspiring. Its material will not be high quality. It is going to be rather thin. Its handles will not be sturdy and could be torn at the worst moment. The cheapest diaper bag cannot meet your expectations to become the baby’s portable home. As we can see, a very budget diaper bag is not a good option. One more little tip: when your baby is grown and has no need for diapers anymore, you can use your diaper bag as you wish. At least, it can become an organizer for your kid, where he or she could the toys and get them out. LeSportsac has been designing casual bags for more than forty years. The diaper bags of this brand are very cute. Especially the bags of the Zoo Cute design. The bag reminds of a zoo because its exterior is full of funny figures of elephants, lions, monkeys, and giraffes. A variety of colors and prints is at your disposal. The diaper bag of this American brand is the best lightweight diaper bag. This diaper bag is very light when empty because of its lightweight smooth nylon. The bag has several inner compartments for your belongings. The woven handles are sewn especially sturdily. The bag comes with a shoulder strap, which allows you to free hands. Besides, you can hang it on the stroller. This diaper bag is easy to clean. It can be used for city trips and weekend getaways. It could keep not only your and baby’s clothes and toys but a camera, too. By the way, don’t forget to take your camera with you to save the most unforgettable moments of your life. Babies grow up so fast. Diaper Dude designs bags for happy parenting of both parents. From now on, hip dads don’t need to carry bright female bags. 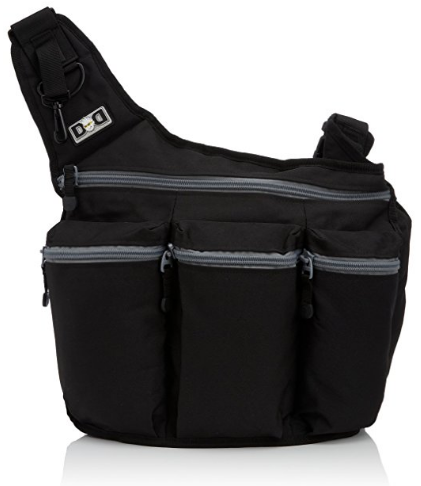 Diaper Dudes bags come in black, gray, navy colors so that a new dad could feel comfortable and full of proud, of course. 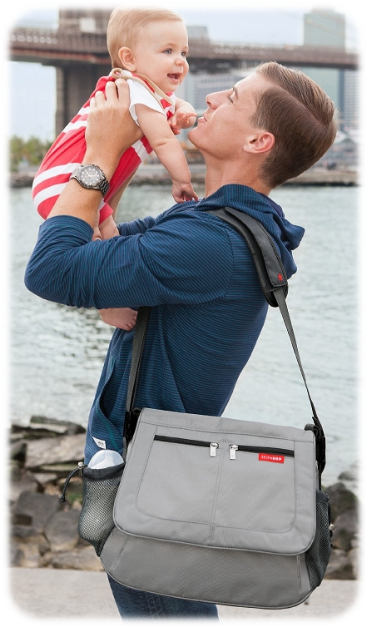 This crossbody bag makes your hands free and can be named the best diaper bags for dads. The bag is messenger-style. It is not too bulky but rather roomy. You can place the most necessary baby things in its pockets very quickly, as well as to get them out. The three pockets on the front of the bag are for the baby’s pacifier, wipes, bibs, the dad’s sanitizer, or snacks for both. Diapers could be placed in the main compartment of the bag. The bag’s zippers are durable. The bag comes with a changing pad, where you can put a change of baby clothes. 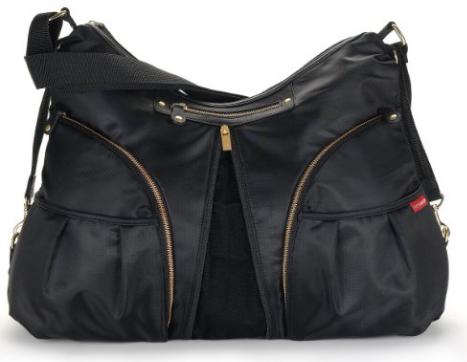 The Diaper Dude Messenger Diaper Bag is one of the best baby showers gifts. This diaper bag is designed for dads, but a young mom can carry it, too. If the dad lets her. The bag is made from a soft material. It looks like a classic handbag. Its expandable bottom makes it roomier. Besides, the bag is very light when empty. It is easy to carry on the shoulder or to hang on a stroller. Anyway, you feel yourself trendy and comfortable at the same time while carrying this sheen bag. The high-quality zippers are made from a golden metal for contrast with the black interior. The linen of the diaper bag is bright blue and water-resistant. When it is dirty, just wipe the spot with a sponge or clean it gently in a washing machine. Though the black bag looks new for a long time. The bag comes with a changing pad. You can take this bag everywhere without risking tiredness or exhaustion. There are plenty of pockets inside the bag for baby clothes and other belongings. There are two insulated pockets for bottles. You can put there the most necessary things, for example, your baby’s sippy cup. The other pocket could hold a phone, keys or a wallet. 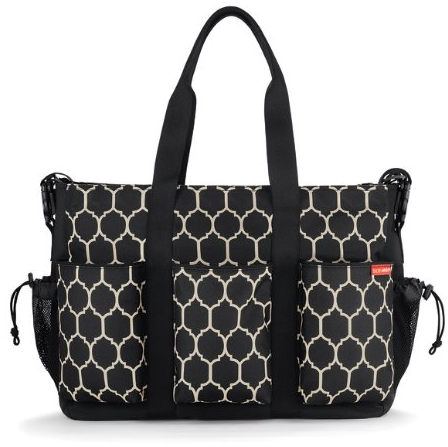 It is, without an exaggeration, the best diaper bag for most trips, such as running errands. It can be named a multiple diaper bag. There are three products in one. This bag is a perfect choice for those who are going to travel with a baby. 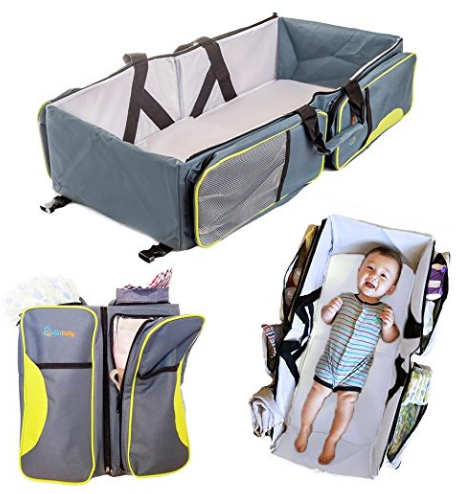 The bag transforms from a typical diaper bag into a travel bassinet, where a baby could relax and sleep in exclusive comfort. The bassinet is made of high-quality materials. 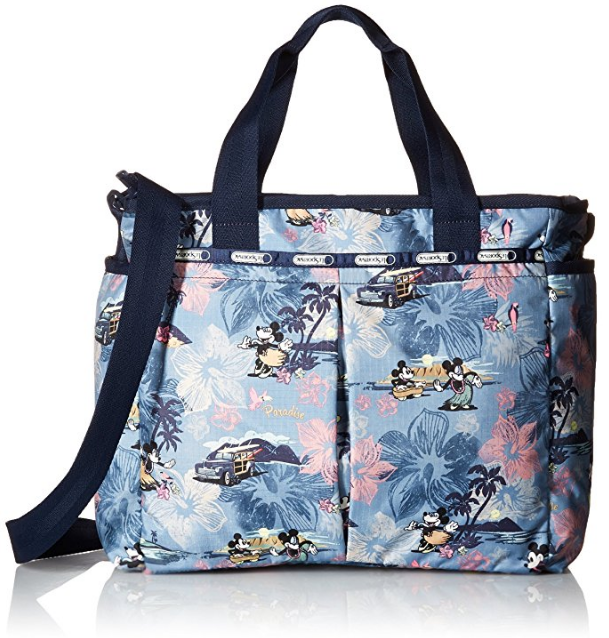 Moreover, the diaper bag could become a portable baby changing table when necessary. Its five zipper compartments store all baby bodysuits, caps, pants and other lovely and cute clothes. One of the pockets is insulated. It is meant for keeping the temperature of your items. For example, you can hold a bottle of warm milk there. The bag can be carried on the shoulder thanks to its adjustable strap. Also, you can free your hands if you attach this versatile bag to the stroller. The bag comes with a foam mattress and a fitted washable sheet. The mattress is easy to clean, too. This travel portable bassinet three-in-one is getting one more name – the best diaper bag for travel. This bag is designed for lucky parents of two kids. The diaper bag is made of poly-canvas. This material is very sturdy, so the bag will keep all your items safely. Its zippers are durable and won’t break easily. The strap of this bag is suitable for carrying the bag not just over the shoulder, but as a messenger bag, too. It is very long, so even tall moms and dads could carry this diaper bag with comfort. When you get tired or want to free your hands, just hang the bag on the stroller. The main shtick of the bag is that it is specially designed for a side-by-side stroller. The bag is spacious. Sixteen pockets are at your disposal! Two side mesh pockets on either side of the bag are meant for water bottles. You can also put your kids’ sippy cups there. The bag could accommodate twin’s essentials with ease. Therefore, it can be considered the best diaper bag for twins. You can place there rather bulky items, such as sweaters, blankets, books and toys for more than one baby. This diaper bag comes with a cushioned changing pad.